Is there a scent you just can’t get enough of? Maybe it’s chocolate chip cookies or freshly ground coffee. These smells may be incredible, but our physiological reactions to them usually don’t involve rolling around, drooling, and spazzing out (unless, of course, that’s your style). There are many cats, however, that react this way when they get a whiff of catnip. If your cat is sensitive to the scent, prepare for some entertainment! What’s up with this phenomenon? Let’s find out! First of all – what is catnip? Catnip is a member of the mint family, a perennial herb called “Nepeta cateria.” The essential oil in catnip, nepetalactone, has a highly euphoric effect on cats who are sensitive to it. Why is my cat freaking out? 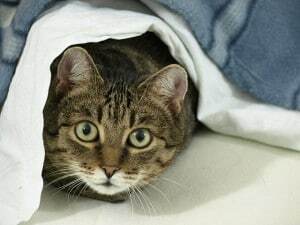 No one knows for sure what goes on in a cat’s brain when it encounters catnip, but it has been determined that the chemical nepetalactone is what triggers the reaction. 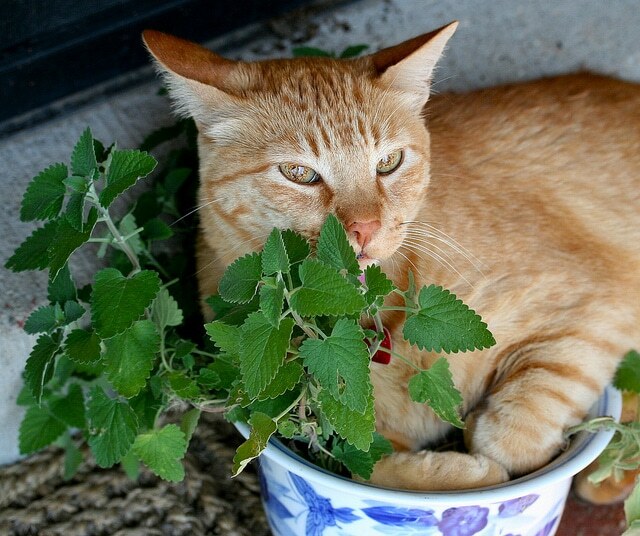 It is believed that catnip imitates the feline “happy” pheromones, and then stimulates the receptors in the brain that react to those pheromones. The euphoria is similar to how humans respond to hallucinogenic drugs. This sensitivity is inherited in an autosomal dominant gene. A third of cats are unaffected by catnip because the gene is not present. If your cat is sensitive to catnip, you’ll witness: sniffing, kicking, head shaking, mewing, purring, sneezing, licking, chewing, and rubbing against the catnip. All of the cat’s senses are involved, making it an energizing and exciting activity for your cat. What’s the best way to give catnip to my cat? Catnip can be used in toys, flakes and pellets, or spray mists. Catnip is safe, non-addictive, and recreational for your feline friend, but make sure you limit how often you give your cat a catnip toy – otherwise the entertaining effects will diminish. Can I use catnip too? Good news! Catnip isn’t just for cats. But rather than stirring up reckless abandon, it has calming effects for humans. Catnip has been grown in medicinal gardens for centuries, and it has soothing qualities similar to chamomile. The nepetalactone oil is also an effective mosquito repellant! 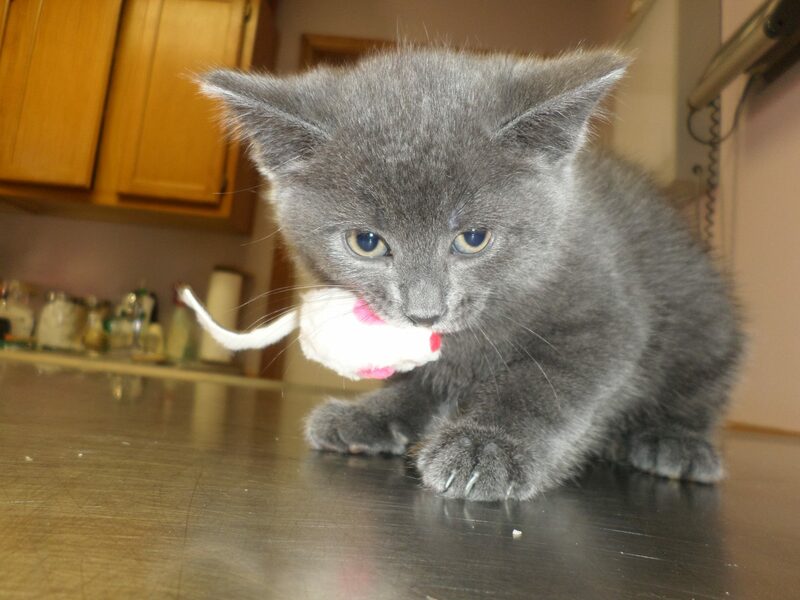 Keep your cats happy with the occasional catnip toy, and keep your cats healthy with the occasional visit to the Cat Clinic at Cherry Hill! We offer a variety of both medical and surgical services for your furry pals. Give us a call at (856) 662- 2662 for more information! Photo Credit: Dubravko SoricHere’s a question that might keep you up at night. You look over at your cat, who is sleeping and purring peacefully next to you, and you wonder…how did you get here? Where did the domestic cat come from, and why did it make its home among people? According to this Smithsonian article, all domestic cats descended from a Middle Eastern wildcat, Felis sylvestris, which translates to “cat of the woods.” Cats were first domesticated in the Near East, and it is speculated that this process began over, wait for it… 12,000 years ago. What was happening 12,000 years ago? The first agricultural societies began to flourish in the Middle East’s Fertile Crescent. The development of grain stores brought economic growth, but it also brought some undesirable visitors: rodents. Cats took advantage of this abundant food source and stuck around these early towns, just like feral cats today. Cats became an asset to crop owners because they turned out to be effective pest control! Some people argue that cats, in a sense, domesticated themselves. Cats appeared to have invited themselves in, and over time people began to regard them fondly, especially cats with friendlier traits. Many cats adapted to this new farmland environment, which produced the dozens of house cat breeds we know and love today- the felis catus. Pet, stray, and feral cats all belong to this species that we call the domestic cat. Cats have traveled and lived among people across the globe. A burial site in Cyprus offers the first archaeological evidence of humans and cats living side-by-side, as far back as 9500 BC. In ancient Egypt, cats were worshipped, mummified, and, as artwork suggests, kept on leashes as part of the cult of the goddess Bastet. Cats boarded ships to the Americas, from Europe, and acted as pest control. Cats reportedly journeyed with Christopher Columbus, with the settlers at Jamestown, and aboard the Mayflower. By the end of the 19th century, many Americans were starting to keep cats for not only utility purposes, but for companionship. Toward the end of World War I, cats were commonly accepted as house pets in the United States. Nowadays, cats are the most popular house pet, with 90 million domesticated cats getting cozy in 34% of U.S. homes. Your love for your cats is expressed in how well you care for them! For superb veterinary services and devoted doctors, contact the Cat Clinic at Cherry Hill at (856) 662- 2662. It’s our mission to keep your cats happy, healthy, and thriving for years to come! Are you saddened by your cat or pet allergy? Wipe away your tears! There is a possibility that you can adopt a cat and still avoid red, puffy eyes. If you want to get technical, 100% hypoallergenic cats do not exist, or research studies have not fully proven it yet. However, there are many breeds that produce fewer allergies than others. We suggest scheduling a play date with a hypoallergenic cat before making a commitment, in case your allergies are severe. Without further ado, here are five cat breeds that people with allergies should consider adopting! 1. Siberian. These majestic creatures hail from Russia. Their gorgeous fur coats make a statement! The Siberian cat is an ancient breed that is believed to be ancestral to all modern long-haired cats. Studies have shown that Siberian cats produce less Fel d1 than other breeds, which is good news for allergic people. 2. Siamese. 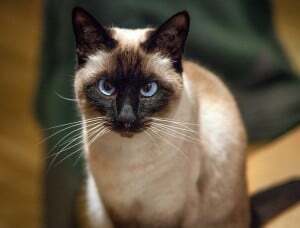 The Siamese cat is a popular breed that is native to Thailand. They are recognized by their blue, almond-shaped eyes, large ears, a triangular-shaped head, and a thin, sleek body. These cats are intelligent, affectionate, and very social. 3. Balinese. The Balinese originated as a natural mutation of the Siamese breed. These cats are known for their startling sapphire-blue eyes, and Siamese-style point coloration. They are considered to be the most intelligent of the long-haired breeds. The Balinese is another breed that produces low amounts of Fel d1 protein allergy. 4. Bengal. The Bengal cat came about from selective breeding to imitate the felines of the jungle, such as the leopard and ocelot. They are known for their large spots and rosette patterns on their fur. Their taxonomic name is “Asian leopard cat.” These cats may look wild, but they are actually very gentle creatures. 5. Burmese. The Burmese breed originated in Southeast Asia, and later developed in the United States. In 1930, a cat from Burma was bred with an American Siamese, creating the Burmese cat. Both American and British breeders developed two different breed standards that contrast mostly in head and body shape. Both varieties are known for their playful temperaments and vocalization. And that’s not all! 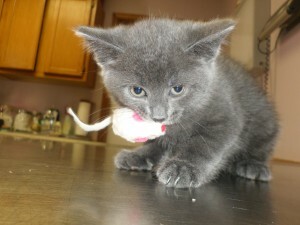 There are many more hypoallergenic cats that give hope to the allergy-plagued world. Check back for more information about cat breeds and cat facts. And if your own feline friend is in need of medical services or a check-up, you know who to call…the Cat Clinic at Cherry Hill! One of our passionate doctors would be glad to lend your pal a hand. Call us at (856) 662-2662 or see where we’re located and stop in! Are you a cat lover, but not a cat owner? Perhaps your landlord won’t let you keep a cat, despite your pleadings. Or maybe your spouse or roommate has a cat allergy. What a miserable life that must be! So, how can you get your cuddle fix? Consider visiting a “cat café.” What is a “cat café”, you ask? Exactly what the name implies! To put it simply, it’s a café with a bunch of friendly cats milling about. You can watch and play with these cats as you sip hot, soothing beverages, for maximum relaxation. Why is this such a marvelous idea? Aside from the obvious reasons– cats are cute, cuddly, and fun to play with– spending time with animals can be wonderfully therapeutic. Studies have shown that animals can help reduce stress levels and boost your mood. The physical act of petting can be healing, and playing with cats can be a great distraction from the stressors of life. Placing these kinds of cafés in major cities is a wise idea as well. Many apartment tenants are unable to have pets of their own, and the only other option would be to volunteer at an animal shelter. This is a fantastic middle ground for cat lovers who don’t have the privilege of owning their own fluffy friends. Who came up with this brilliant business endeavor? The first cat café, “Cat Flower Garden”, opened its doors in Taipei, Taiwan, in 1998. The idea has traveled to Japan, Austria, Germany, Russia, Hungary, France, Italy, Spain, Canada and finally the United States! 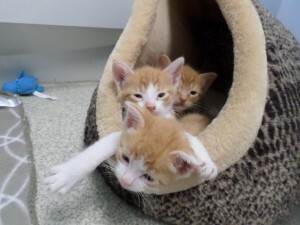 There are over 15 cat cafés projected to open over the next year or two. The USA is finally catching up! 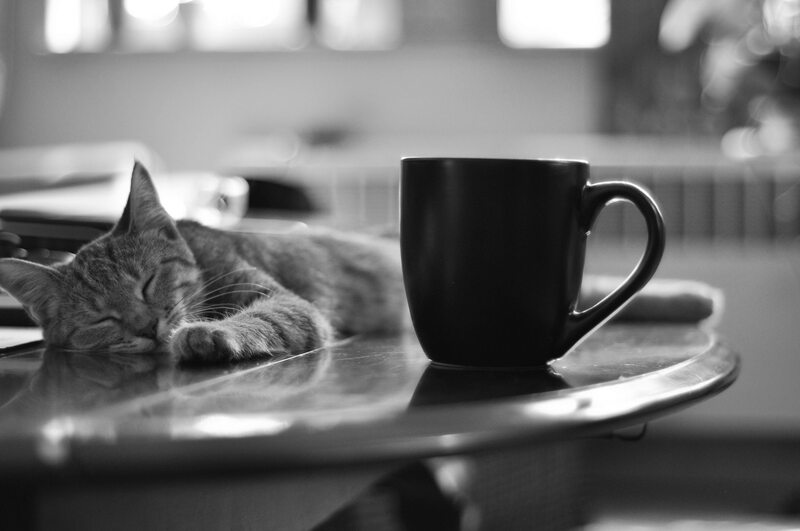 A woman in Washington, DC is trying to open up a cat café this summer, “Crumbs and Whiskers,” so we may have to make a trip out there just for that. Can we get one in Philadelphia, please? We would definitely endorse that project. So, whether you’re a cat café entrepreneur, or simply a cat owner, your feline friend is going to need some medical assistance to keep it happily purring. That’s where we come in! Contact us today, and find out more about our medical services! Well folks, this is our first blog post! If you’re wondering why we’ve just started blogging now, it simply feels like it’s the right time. With decades of experience as a cat vet in Cherry Hill, we have many cat tails to tell. We’d like to provide our fellow cat lovers with feline-filled content. Here we will discuss what we’ve learned and experienced over the years at the Cat Clinic at Cherry Hill. The goal is to just provide you with something informative yet fun. And what better way to kick off our blog than by professing our love for our feline friends? Now, unless you suffer from cat allergies, there really is no excuse for not owning a cat. If you do own a cat then you’ll probably agree that the following are the top five reasons cats make for the perfect pet! Felines are known for their sharp intelligence. While comparing cats and dogs is like comparing apples and oranges, it’s safe to say that cats are super smart in their own right. They are able to hone mental and physical abilities through practice and are great learners of tricks when you take the time to teach them. It’s no secret that cats are some of the silliest creatures on this planet. Whether they’re playing with you, another feline friend or just by themselves, they are sure to bring the laughs! As fellow cat owners and expert cat doctors in Cherry Hill, we’ve seen cats do some funny things over the years. Cats are pretty easy to please, as well as easy to housebreak and clean up after. Who doesn’t love that?! Cats make for the perfect pet for neat freaks because you won’t have to deal with repetitive accidents. Also, not having to walk cats is a bonus. During the rain or freezing cold winters, having to take a pet outside must get tiresome. Just make sure to maintain the litter box, provide food and water, and you will have a happy cat on your hands! With their supersensitive ears, cats have a knack for seeking out pests. They also have no qualms about eradicating these pests, if/when they get their paws on them! Think of it as nature’s pest control. Above all else, cats are incredibly cute creatures. Depending on what kind of cat you have, they can be extremely fluffy and make for a great cuddle buddy. Even if your cat isn’t the snuggling kind, they’re still an adorable companion. Of course there are plenty more reasons why cats are so lovable and make for great pets. But for today, these five should do! If you’re ever in need of the medical services of a cat doctor in Cherry Hill, look to the Cat Clinic at Cherry Hill. We are cat fanatics and, more than anything, we love to help our local feline friends maintain their health and happiness. For more information on our Cherry Hill cat clinic, please take a look around our site or give us a call at (856) 662-2662!